In the wake of the recent flooding throughout the region, we look at the aftermath in terms of insurance payouts. Kari Dolan, Vermont’s National Flood Insurance Program coordinator, and FEMA Regional Flood Insurance Specialist Lauren Pawlik tell us who must have flood insurance, what it covers and doesn’t cover and why some Vermont communities are not part of the Program. And we learn what FEMA relief would be available if the President declares Vermont a disaster area. Plus, we talk with Betsy Reid of Home Share Now in Barre. She explains what home sharing is and why more and more Vermonters are turning to this way of finding a place to live or of having someone share their living space. 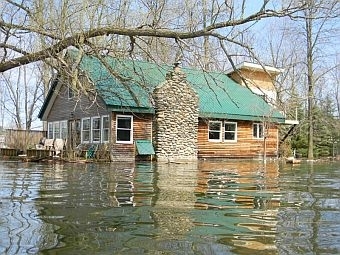 The U.S. Congress has extended FEMA’s National Flood Insurance Program another five years. In the process, it has made changes that could have an impact on thousands of Vermonters enrolled in the program. The issue of flood insurance is now a big headache for some water-logged communities around Lake Champlain. Forty-two towns and villages in Vermont do not participate in the National Flood Insurance Program, which means homeowners in those towns can’t get federal flood insurance.